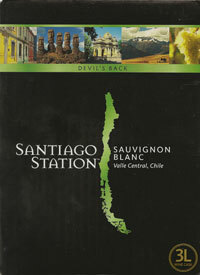 Our rating: A week ago we reviewed a bottle of Santiago Station "Devil's Back" Sauvignon Blanc NV. At the time, we mentioned that we had also purchased the 3L box version of the same wine, and would be comparing the two. This is that comparison. We've copied our taste profile from the previous review, as it generally applies here (though we though the box had somewhat more tree fruit character). But after pouring two glasses, one from the bottle and the other from the box, there seemed to be subtle differences between them. These include: the bottled wine is ever so slightly lighter in color, with more of a silver tint; the boxed wine has a more noticeable green apple aroma; the bottled wine is initially softer on the palate, developing an edge as it progresses into the finish whereas the boxed wine has a more uniform palette character. Of course, because these are non-vintage wines, we have absolutely no idea whether this comparison is meaningful or not. Still, with the box priced at the equivalent of $3.50 a bottle, and both rated Above Average, we think the box is an amazing bargain. And probably better for the environment too!